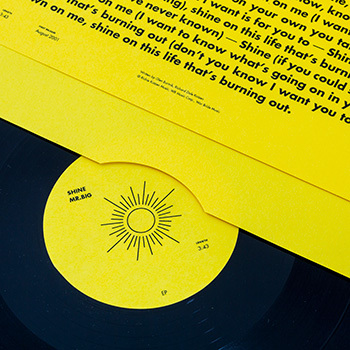 SHINE is a re-imagined vinyl record packaging inspired by the eponymous song by Mr. Big. 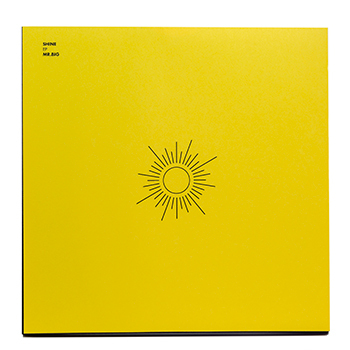 As one lifts open the record sleeve, the Sun 'shines' in a wheeling motion as a response. 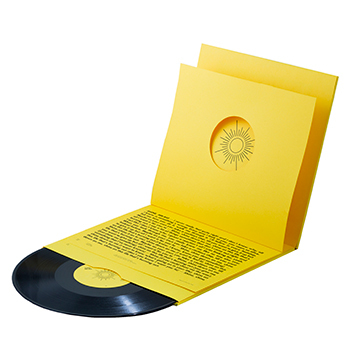 The result is a physical experience with the sleeve that is wondrous and delightful. 'Shine' is significant to us, as it is one of those songs that help us look at each day bright and hopeful. It is these feelings that we want to capture and impart to the audience who interacts with the record sleeve. The entire sleeve is meticulously made of papers reinforced with grey boards. Jonathan Yuen is the founder and creative director of Roots, a new independent interdisciplinary design studio based in Singapore. Having been in the industry for over ten years, he has worked in the interactive, print and advertising fields, producing cross-disciplinary works for a wide spectrum of clients, including global brands such as Nike, The Economist, OCBC Bank, WWF and Nokia, as well as many smaller, independent brands and businesses. Over the years, his work have been recognised in regional and global award shows, including Cannes Lions, D&AD, One Show, Art Director Club, AdFest, Communication Arts, Webby Awards, YoungGuns Awards, and featured in numerous established design publications. He emphasises honesty in his work. He believes that being honest produces good design, and good design relates to the right people. With the new studio, his focus is to continue producing captivating, intelligent and beautifully crafted design with forward-thinking ideas and executions.